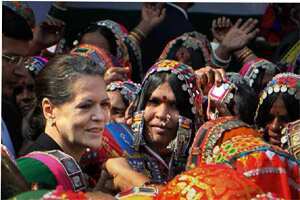 New Delhi: UPA chairperson Sonia Gandhi on Friday favoured an approach of welfare and development to defeat left-wing extremism and insurgency and bring back youth involved in it back to the democratic mainstream. She called upon both the Centre as well as states to address the issue seriously, saying it is their fundamental and constitutional obligation to ensure development of tribal areas. “The Centre and state governments should do their fundamental and Constitutional duties in helping tribal areas with full earnest. “I feel that if we do this, we will be able to bring those people who have adopted the culture of violence back to the democratic mainstream," Gandhi said. Addressing tribals and mahila Congress workers, she called upon them to campaign for tribal rights in states where the Centre’s welfare programmes were not being properly implemented. “It is the responsibility of mahila Congress and you all to create awareness of various central welfare schemes at the block and district level and guide the tribals in such a way that make use of them. Wherever such schemes are not implemented, you should struggle and also resort to a movement (andolan)," she said.